The public is invited to MilfordMD’s Lips & Hips Event on February 16 at 5 pm. The party will include live demonstrations, event-only coupons, raffles, prizes, gift bags and more. Dr. Buckley uses a half syringe of a popular cosmetic filler to treat earlobes. The hyaluronic acid filler helps to fill in any lines or creases, diminish the size of the ear piercing and make the lobe more youthful looking. 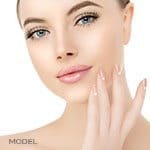 Soft tissue fillers, including hyaluronic acid fillers, are known for their cosmetic use to augment areas, such as the cheeks and lips, as well as fill in fine lines and facial folds, including the nasolabial folds. These filler products, including Restylane products, Juvéderm and Belotero, also can be used to rejuvenate the décolletage, backs of hands and, now, the earlobes. “The whole idea is to augment, or help to refill, areas that have deflated or lost their ‘plump’ over time,” Dr. Buckley says. “Hyaluronic acid fillers are a great option because they’re not permanent, but can last as long as a year (so, people rarely have to come back for touch-ups to maintain results). The treatment doesn’t require that patients take any time off work. And results are immediate.” Chinese researchers recently studied the use of a hyaluronic acid filler for earlobe augmentation and published their results December 28, 2016 in the scientific Aesthetic Plastic Surgery journal. In the study of 19 patients undergoing earlobe augmentation with HA fillers, they found immediate post-treatment improvement of the lobes. And results lasted up to nine months. They concluded that this approach to earlobe rejuvenation is safe, effective and simple for earlobe shaping. Treatment for earlobes takes only a few minutes in the office. Dr. Buckley says he can use a little numbing cream to ensure patient comfort, but many patients are comfortable without the numbing cream. “Patients love earlobe rejuvenation with fillers because they can go right back to wearing earrings. If they want, patients can even wear their earrings during treatment. 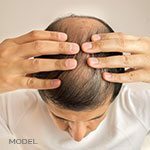 That’s how noninvasive this approach is,” Dr. Buckley says. 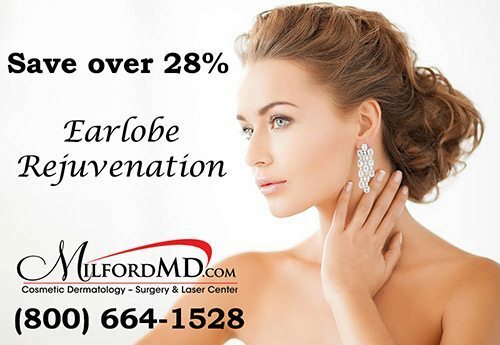 For more information about the “Love your Lobes” special at MilfordMD Cosmetic Dermatology Surgery & Laser Center and how to save on earlobe rejuvenation, call MilfordMD at (570) 900-3145 before February 28, 2017.